Standard: AISI 316 - Cast Iron GJL250. On request: Duplex, Superduplex, AISI 304, AISI 904, Hastelloy. Simple and modular construction with bearing bracket in according to ISO 2858-5199 norms. Discharge sizes from DN 65 to DN 300. 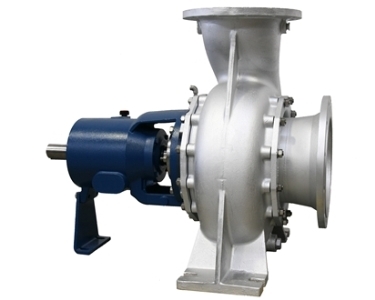 Impeller with special blades geometry for low NPSH and high free passage. Heavy duty shaft and bearings. Only 5 bearing brackets for the whole range. Only 1 casing cover fits every seal arrengement. RB pumps can handle slightly contaminated liquids in waste water treatment plants, clean water for cooling towers or condensate recovery plants, viscous liquids in evaporators in food or chemical industry. They are also used in refineries, general industrial service, pulp and paper industry, foodstuffs industry, sea water desalination plants, absorption equipment in environmental engineering, power stations, steel industry and hot water distribution. RBB: Independent frame with oil lubricated bearings. RBL: Lantern bracket with flex coupling and standard B5 motor. RBM: Close-Coupled with standard B5 electric motor. RBC: Cantilever Pump (on request).